Flower power in the top ten. No need to lie about this one, and that’s the cold hard truth. The bubbly song with just the right amount of angst was a winner, at least on my personal chart. “True Love” marked the fourth consecutive hit on my chart from Pink‘s The Truth About Love, her first album to debut at #1 on the Billboard 200. It was co-written by the two singers and producer Greg Kurstin. I first highlighted the song on the blog on May 2 when it was about to see some overseas action, but several weeks later, U.S. radio got on top of it. This was also the first chart hit in four years for Cooper; last time around, it was “The Fear” that broke into the top 5. About halfway through the chart run of this duet, Cooper began using her professional name, Lily Allen, once again, creating a whole bunch of confusion on how to actually credit it. Nevertheless, even that couldn’t stop it from spending three weeks at #1 on my survey, one of the top collaborations of the year. After three significant radio and sales releases from her album, this particular song couldn’t match Pink‘s previous success on a national level in the States, missing the top 40 on the Hot 100. However, as the Queen of Australia (let’s face it, she is), she managed a #5 peak in that territory, as well as higher peaks in Belgium and the Czech Republic. In short, the “Love” fest went on. Rule Britannia, Britannia rules the waves and the airwaves (at least in Adam’s world) this week in what could be my first top 5 ever with songs either fully or partially recorded by British acts. Call it a top 4 1/2. 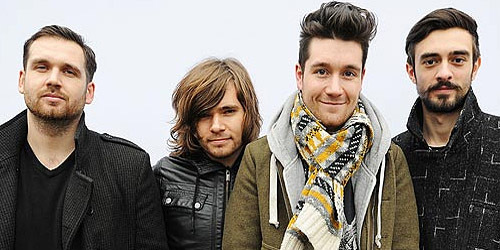 That includes this week’s #1 for a second week, “Pompeii”, by the London-based quartet Bastille. Their album, Bad Blood, is out here this Tuesday. The only split single is at #4, “True Love”, the collaboration between Pink of the U.S. and U.K. born Lily Rose Cooper. By the way, the closest I’ve ever come to a British top 5 up to this point was when four Brits ranked that high, last occurring in January 2012: Graffiti6 with “Free” (#1), Adele with “Set Fire To The Rain” (#2), Olly Murs with “Dance With Me Tonight” (#3) and Coldplay with “Paradise” (#5). It wouldn’t be a stack of notes without mentioning something about Passenger, so here’s this week’s update: the 29-year-old from Brighton, England is now the first act since August 2006 to have two songs together in my top 3. “Holes” is holding steady at #2 for a second week, while “Let Her Go” rebounds from 4-3. This is also the 20th week in the top ten for “Go”, which is by no means a record, but still pretty impressive considering the song has spent half of its run at #1 and nearly 80% of its run in the top 5. Way to go, Mike! Two songs tie for Biggest Mover in the countdown this week, each up by seven spots: Emeli Sandé rises 38-31 with “My Kind Of Love”, while Daft Punk and Pharrell Williams move 26-19 with “Lose Yourself To Dance”. Both are building at radio on different formats here in the States. Hunter Hayes takes this week’s Highest Debut with “I Want Crazy”, entering at #38. His third song to reach my chart is a recent #1 from the Country survey, now remixed for a pop audience by Ryan Tedder of OneRepublic. His biggest single so far, “Wanted”, went to #5 on my top 40 earlier this year. There must be a full moon over the chart this week because five acts have two songs placed on the chart and three (!) of them are back-to-back. There’s Passenger at #2 and #3, Sheppard at #27 and #28 and lastly, Walk Off The Earth, whose “Gang Of Rhythm” debuts at #39 and former top 5 single “Red Hands” drops to #40. Not quite “tumbling down”… yet. If you’re not in the loop about why Passenger is re-bulleted with his former #1, “Let Her Go”, perhaps this post of mine from Thursday will help. He also leaps from 5-2 with “Holes”, which is now one spot away from becoming his second #1 in a row. Once again, it was great to meet and chat with him. I think you’ll find that the Brighton-born singer won’t be vacating the top 5 for some time and that’s just fine. Biggest Mover honors for the second week in a row belong to Katy Perry, up this week from 25-18 with “Roar”. In a twist this week, it’s placed next to “Brave” by Sara Bareilles, which falls from 14-17. Just thought that it needed a mention, not that you need to hear it any more. Thanks, Internet. A year to the chart week that her last single, “Next To Me”, fell off after a #8 peak, Emeli Sandé finally manages to break the top 40 with her next U.S. release. “My Kind Of Love” is this week’s Highest Debut at #38. One spot below her is the musician whose last single, the #16 “I’ll Be Your Man”, fell off two years ago this week. James Blunt is back, beating again at #39 with “Bonfire Heart”. It’s from his forthcoming album titled Moon Landing. Last, but not least, is the debut of a new band. The four-piece American Authors are originally from Boston and are now based out of Brooklyn, NY. “Best Day Of My Life” debuts at #40. Their self-titled EP is out on Tuesday. Holding onto the top spot for a third week, Pink and Lily Rose Cooper continue to dominate, but it looks at though they may be knocked out next week by either Bastille or Five For Fighting. If it happens, it would be the first #1 for the British band or the fourth #1 for the California singer-songwriter. 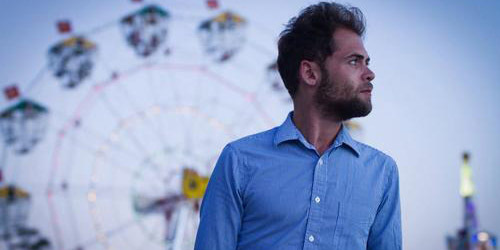 Tacking on another achievement to his growing list of them, British singer-songwriter Passenger now has two songs in my top 5, with “Holes” climbing 7-5 and “Let Her Go” dropping 2-4 after a 12-week run at #1. Only a handful of acts have managed to pull this off in my chart’s history, including Daniel Powter and James Blunt in 2006. It’s probably not the biggest shock that Katy Perry takes the title of this week’s Biggest Mover with “Roar”, leaping from 40-25. It’s the first single from her forthcoming album, Prism, due in October. It should be in the top ten by early September. The Highest Debut of the Week belongs to Australian sextet Sheppard, who enter at #39 with “Hold My Tongue”. It’s the second single to chart from their self-titled EP. First single, “Let Me Down Easy”, falls to #20 this week. Also debuting this week is former Westlife member Shane Filan. His first solo single, “Everything To Me” is in at #40. Last time he was in with the band was back in 2002 when “World Of Our Own” peaked at #6. Mika and Ariana Grande take a huge leap from #39 to #27 with this week’s Biggest Mover, “Popular Song”. It was one of the most added singles at mainstream radio this past week. Mika last made my top 40 in the fall of 2009 with “Blame It On The Girls”, which rose to #11. This week’s Highest Debut belongs to Danish rockers New Politics and their first single to make my chart, “Harlem”. It enters at #38. It’s a recent top 5 single from the Alternative chart that is now looking to make some waves on CHR radio. Las Vegas quartet Imagine Dragons are back in my top 40 with “On Top Of The World”, debuting this week at #39. It’s their current single in Australia, where it’s a top 20 seller at the moment. It comes from their album Night Visions. After a leak yesterday morning, Katy Perry‘s latest, “Roar”, doesn’t quite roar into the survey, but a #40 debut is going to have to do for this week. Look for it to make a large climb on the next chart. 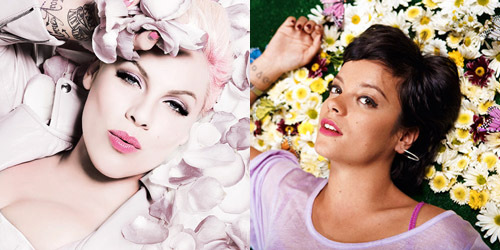 Pink and Lily Rose Cooper have finally taken over the crown to become the first new #1 single on my chart since May. Sorry, Passenger. “True Love” is the fourth single from Pink‘s album, The Truth About Love, and all four singles have made the top 2, making it her most successful era ever on my chart. It also becomes her sixth #1 on my chart and the first for Cooper. Making a strong move into the top ten this week is Bastille‘s “Pompeii”, up 11-8. The recent #2 song in the United Kingdom could potentially go that far or higher on my survey. Also look for Passenger‘s “Holes” (up 14-11) to go into the top ten next week, which will give him two songs in that sacred section. One Direction takes Biggest Mover honors for the second week in a row with “Best Song Ever”, gaining eight spots to climb to #24. It serves as the first single from the soundtrack to This Is Us, their forthcoming concert film, and the lead single from their next studio album, Where We Are. The highest of this week’s three debuts is Mayer Hawthorne‘s “The Stars Are Ours”, entering at #37. His recent release, “Her Favorite Song”, is back at #2 this week. Hawthorne is currently an opening act on tour with another Adam’s Top 40 favorite, OneRepublic. The two other new songs this week are collaborations: Mika and Ariana Grande take “Popular Song” into the #39 slot, while the second single together between Daft Punk and Pharrell Williams, “Lose Yourself To Dance”, shuffles in at #40. Both are expected to do well into the fall. Doin’ it by the dozen. After looking as though he would be the one to finally push Passenger out of the top spot, Mayer Hawthorne drops back to #3 with “Her Favorite Song”, while Pink and Lily Rose Cooper advance to #2 with “True Love”. Two against one may be an unfair fight, but the truth hurts, and these two ladies are looking to take over this chart ride. Will it happen next week? Stay tuned. This week, I purchased physical editions of EPs from British bands Bastille and The 1975, and it just so happens that the two acts score big jumps in the countdown this week. “Pompeii” from quartet out of London rises 16-11, while “Chocolate” from the Manchester group is jointly-tied for the Biggest Mover of the week, up 31-24. Both songs are expected to make the top ten. This week’s Highest Debut is a duet between former U.K. X Factor winner Matt Cardle and Sporty Spice of the Spice Girls, Melanie C. “Loving You” is in at #39. It’s Cardle’s fifth song to make my chart (his last, “Anyone Else”, went to #17 earlier this year) and the third song to chart for Miss Chisholm, her first since “I Turn To You” went to #30 in 2001. Australian indie rockers San Cisco quickstep onto the survey at #40 with “Fred Astaire”. It’s their first song to make the chart. They’re one of two Australian acts in the top 40 with Sheppard being the other. As for next week’s potential debuts, Mayer Hawthorne‘s chances look promising with “The Stars Are Ours”, while Capital Cities, MKTO and others keep climbing up. Phillip Phillips also looks to enter the top 40 in the next few weeks.